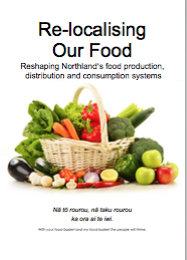 Dr Laupepa Va’a of the Northland District Health Board (DHB) is working on a major project investigating the feasibility of a more integrated approach to food recovery. He is busy engaging people involved in food recovery and food access. Globally, we waste one third of food produced. The good news is that we produce enough to feed everybody already. This graphic from the Love Food Hate Waste website reveals over one trillion dollars of food waste, most of it from the degradation of nature. In New Zealand, the average family throws away $563 worth of uneaten food per year. Bread is at the top of our waste list – we throw out 12,856 tonnes of bread. Click here for a larger image. Reducing our waste is a win-win. In the Northland context, we know that there are many children going to school hungry. Food for Life is doing a great job in Whangarei, but they are only able to operate in a handful of schools. Hungery school children don’t learn very well. In addition to providing better food access, there are many environmental benefits from reducing food waste. Sources for food recovery are diverse. In a recent post we featured Free Fish Heads, a website designed to connect those who have fish heads and normally dispose of them, and those who eat them. In Whangarei, Food for Life, operating across the road from the Whangarei Growers Market, gathers unsold food from generous stallholders and turns it into meals for school children. The challenge is to identify all the potential sources of food and get it to those who are most needy. Here is a great example of software facilitating better resource use. The ability of software to facilitate direct connections between producers and consumers are important in developing more sustainable food systems – in this case, reducing food waste. Free Fish Heads from Tightlines Television on Vimeo. Here is a link to Free Fish Heads. Earthcare Education Aotearoa are finding inspirational stories about local food across Aotearoa (New Zealand). Their latest video explores plantings of fruit and nut trees in public spaces from 50 locations around the country. This video introduces the project. Fruit & Nuts UNLIMITED! – TRAILER from The Localising Food Project on Vimeo. Here is a link to their Pledge Me site to fund the project. Pam Warhurst is in New Zealand sharing the message of edible landscapes. In 2009 she and her friend Mary cleaned up a piece of waste land in her Yorkshire Town of Todmorden and planted veggies. This started a movement that is now world-wide. In her interview with Kim Hill Pam relates how Todmorden has been transformed through the three related sets of action – what Pam calls three plates. The first is community action, manifest in planting food in spaces on berms, in front of shops, anywhere that a plant can take hold. The food is free for others to take – and generally people respect and get engaged to give back. The second plate is education – reviving the arts of growing, cooking and preserving food. These activities can be integrated into most curriculum areas in schools. The third plate is business. Ironically providing free food for people stimulates food enterprise. Farmers see niches opening up and diversify into, for example, cheese making, cafes start to sell local food. Now Todmorden is benefitting from what Pam calls vegetable tourism. She calls this a “sticky economy” because people chose to spend more money locally. Pam tells her story and explains the three plates in this Ted Talk. Pam is a superb communicator and exemplifies an inclusive approach that engenders engagement rather than alienation. There are lots of things that we shouldn’t be doing in this world, but she prefers to focus on the positive things we can do – the small actions all of us can take. “People respond positively to being positive”. Her journey has taught Pam the power of small actions. If we could believe in the power of small actions… that is the thing that has come out of this, we all have actions that we can do collectively, if we join up the dots, create something much bigger. Pam is spending time in Christchurch, a city being recreated after the recent earthquakes. Nearby Geraldine has embraced the edible landscapes kaupapa with locals finding all sorts of spaces to grow food. For Pam, its all about working together to make a better world.